Vaseem Khan was born in London in 1973. His father was born in pre-partition India and his mother in Pakistan. He gained a BA in accounting and finance from the London School of Economics, and worked as an accountant before becoming a management consultant to an Indian hotel chain, which involved travelling around the subcontinent. He met his wife in India and in 2006 they moved back to the UK. He joined University College London's Department of Security and Crime Science as Business Development Director. His role brings him into contact with crime investigations and police practitioners, where he is astonished on a daily basis by the way modern science is being employed to tackle crime. 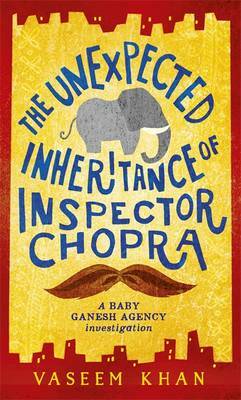 His first novel, The Unexpected Inheritance of Inspector Chopra, combines Mumbai, murder and a baby elephant in a joyful mystery reminiscent of the work of Alexander McCall Smith. It is the first in a projected series. 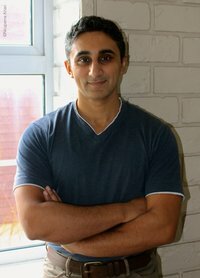 We spoke to Vaseem about his desire to show not just the luminosity, colour and warmth of India but also some of the darker elements of society, how his day job at the cutting edge of crime science informs his writing and the writers who have inspired him, from Isaac Asimov to John Irving and Ian Rankin. You’ve said that seeing an elephant walking through the streets was the original inspiration for the novel – indeed for becoming a writer altogether - but what came next; the Inspector or the crime? A slight correction … I have actually been writing since a young age, albeit as an unpublished amateur. Seeing the elephant in Mumbai simply ignited in me a passion for pachyderms, something that later came back to inspire the Baby Ganesh series. Inspector Chopra definitely came next. Once I decided to write a crime novel based in Mumbai – and decided it would feature a baby elephant – I knew that it needed a strong lead character to partner with Ganesha. After all, what is a buddy-buddy cop caper without the straight man? I wanted the lead to be someone quintessentially Indian, a man who, in many ways, idealised the virtues that I saw in the people I met during my time there. The crime itself was the last piece of the jigsaw – and for that I was inspired by actual, harrowing events in the country. I don’t want to reveal the crime as that would be a plot spoiler but suffice to say that it is a crime that demanded to be written about, purely in terms of the scale of human tragedy it represents. Do you have a clear plan for the progression of the series - will the elephant grow with each new novel or will Baby Ganesh stay as a baby? The charm of the series lies in the fact that Chopra – this rigid, late-middle-aged police officer – has had to adopt baby Ganesha, with all the awkwardness this entails for someone who has hitherto lived a very ordered life. Chopra’s innate goodness forces him to rise to the challenge but it is by no means an easy transition for him. Ganesha also offers a lot more to the series as an infant, I feel. He evokes in Chopra, Poppy (Chopra’s wife), and all of us both a sense of fun and joyful affection but also an immediate desire to protect and nurture. In a sense he is not just Chopra’s ward but our ward. So, yes, the plan is for Ganesha to remain a baby for as long as possible. This means that the initial sequence of mysteries will follow close on the heels of one another. Of course, in the fullness of time we will see Ganesha begin to age, so that his character can progress through its own emotional development, bringing a new dynamic to the relationship with Chopra. Can you imagine Ganesha having a teenage temper tantrum! I can. The family dynamic between Inspector Chopra, Poppy his wife, and his mother in law is beautifully drawn - will this be further developed as the series progresses, and were the characters based on anyone? Chopra is not based on anyone in particular, but much of his character and viewpoints reflect my own values and outlook. Poppy’s personality is based, in part, on my wife Nirupama. Many of her passions are Poppy’s passions. Also Chopra and Poppy could not have children. My wife and I have gone through this issue – we do not have children – and so that part of the novel is very real to me. The mother-in-law is one of my favourite characters but is not based on anyone – certainly not on my own mother-in-law who is an absolute sweetheart! What kind of reception to you hope / expect to receive in India? A positive one, I hope! I have been quite careful in representing things as they really are, rather than as either idealised visions of how westerners might view the ‘exotic’ subcontinent or as unnecessarily grim caricatures of a foreign land. This means that as well as the luminosity, colour and warmth of India I have also presented some of the darker elements of society, such as the endemic poverty and crippling differences in class. I lived there for a decade so I believe I have earned the right to present my take on things. I think, overall, my great love of Mumbai, in particular, and India (and Indians! ), in general, shines through. You work in the Department of Security and Crime Science at University College, London, but were you familiar with police and legal procedures in India or did this require research before you started writing? The truth is that police procedures do not differ across countries as much as crime fiction would have us believe. It is more a case of local idiosyncrasies and, of course, the fact that many developing counties are years behind in resources, training and technology. But the basics are the same: crime scene analysis, autopsies, interviewing of witnesses and suspects, and a good old-fashioned detective who never gives up! I am lucky enough to have a former senior Indian police officer – Dr Jyoti Belur – who works in my department. Jyoti has been wonderful in helping me with the finer details of police and legal procedure in Mumbai. She used to carry a gun, so I tend not to argue with her when she tells me something should be just so! You hear of crime novelists going on ride-alongs and see them on the shooting range in order to get colour and detail for their novels; did you do any of these or other exotic things? I did a ride upon! When I got married my family came out to India for the wedding, and we took them along for a grand tour as part of our honeymoon. We went to see the Taj Mahal, Goa, and Jaipur. In Jaipur I rode up to see the Red Fort on the back of an elephant. It was my first such experience and I remember putting my hands around this magnificent creature’s neck and breathing in its wonderful smell. When I look back on my time in India it seems that I was confronted with a new and exotic experience every day. My first trip to the Dharavi slum, my first monsoon, my first journey on an insanely packed Indian train … all of these experiences will filter into the novels, providing the colour and detail that you mention. Your day job is at the cutting edge of Crime science. Are you going to be incorporating any of this into your writing? Absolutely. It would be a crime not to. Ho ho. I am lucky indeed to be sitting in the midst of so many experts. I only have to walk out of my office and tap a colleague on the shoulder for advice on a particular crime topic I might be thinking of incorporating into my work. Even better, just sitting around and chatting about their latest research often throws up ideas for future plots and sub-plots. For instance, Dr Belur recently completed a project on the Naxalite-Maoist insurgency in eastern India. As Chopra and Ganesha will be travelling around the subcontinent in later adventures this may well provide a rich backdrop for a future story. Two new ‘cyber-crime’ colleagues have joined the department researching aspects of the ‘dark web’. With law enforcement around the world focusing heavily on cyber-crime this seems like prime material for a future crime novel. Will the Baby Ganesh series be your main focus of writing or do you have other stories to tell? Yes, the Baby Ganesh series will be my priority over the coming years and I have some wonderful ideas for future novels in the series that will give us further insights into the lead characters as well as the amazing country that is India. I do, however, like to write other things and plan to release them into the wild in the future. I write very quickly – insomnia and a daily two hour commute does have the advantage of giving me plenty of time to work on the next ‘big’ idea. So watch this space. You’ve been living in England since 2006. Do you think India will always play a big part in your fiction? India is the backdrop for the Baby Ganesh series and will always be a source of inspiration for me. A series like this allows me to explore India in all its multifaceted glory. Suffice to say that Chopra and Ganesha will be on the move – Mumbai is India’s greatest city but there are so many other incredible places that I would like to take the readers to. The truth is that India is so vast and regional differences so profound that it is, in essence, a collection of countries held together by a few common threads such as religion and history. As a writer I can’t think of anything better to inspire creativity than exploring the subcontinent – with a baby elephant in tow! Who are the writers you turn to for solace or inspiration? Like all writers I am often in need of both! I grew up on a diet of science fiction so my first inspirations were Arthur C. Clarke, Isaac Asimov and Greg Bear. I actually wrote a heap of SF stories in my teens – I still have the handwritten drafts – they were the first complete pieces of writing that I did. I later fell in love with literary fiction where writers like John Irving inspire me – A Prayer for Owen Meany is my favourite amongst novels that aspire to the accolade of ‘Great American novel’. I admire writers who write with courage – I just read The Help by Kathryn Stockett – about the lives of African-American maids in the American South in the 1960s - and thought it was incredible; the month before I read The Fault in our Stars, and haven’t laughed so much in ages – John Green did such a brilliant job tackling the subject of teens with terminal cancer! I got hooked on crime fiction in my twenties. Ian Rankin’s Rebus series is wonderful – I am in awe of how he effortlessly creates a character like Rebus who has so many faults and yet we fall completely under his spell. I love Jeffrey Deaver’s quadriplegic hero Lincoln Rhymes and his partnership with feisty Amelia Sachs. Deaver is brilliant at putting in twists and I think every crime author can learn from him. America’s Michael Connelly is my favourite – his L.A. based detective Harry Bosch is my kind of crime fighter – grim, gritty and utterly implacable in his mission. That mission is one that Inspector Chopra identifies with. To pursue justice no matter what it takes, no matter what it costs him personally.